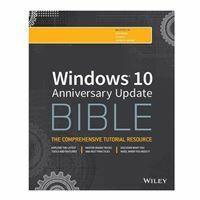 Windows 10 Bible, Anniversary Update presents the ultimate reference for enterprise and professional Windows 10 Anniversary Update users. From setup and settings to networking and the daily workflow, this book provides expert guidance on all aspects of the OS. Read from beginning to end for a comprehensive tour of all of the nooks and crannies, or dip in as needed to find quick answers to your most pressing issuesformatted as a reference divided into mini-tutorials, this guide delves deep into the Windows 10 Anniversary Update to walk you through every inch of functionality. Personalize your settings, desktop, and security to augment the way you work; configure Windows 10 for enterprise with remote access, groups, and Hyper-V; set up a private network for two or 20 computers, and manage security to keep your content safeeverything you need to know is explained here.